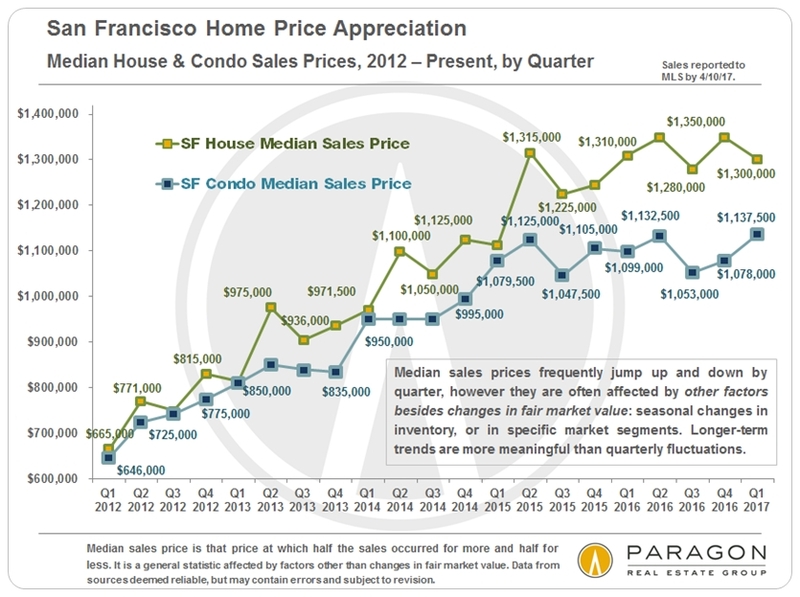 In recent months, there have been multiple reports in local media about Big Drops in San Francisco Home Prices! But, umm, we are not seeing it, neither on the ground in the hurly burly of buyers and sellers making deals, nor in the year-over-year quarterly statistics of supply and demand. News articles often make a big deal regarding the median sales price in a single month, but monthly data is often gravely deficient as an indicator, fluctuating up and down without much meaningfulness due to a number of factors. January and February are particularly bad months to draw conclusions from: The lowest sales volumes of the year, reflecting deals negotiated during the December-January market doldrums, with weather issues sometimes thrown in besides (for instance, in early 2017). Last but not least, the media often mixes property types to come up with a single median sales price, and that is generally not a good idea either. 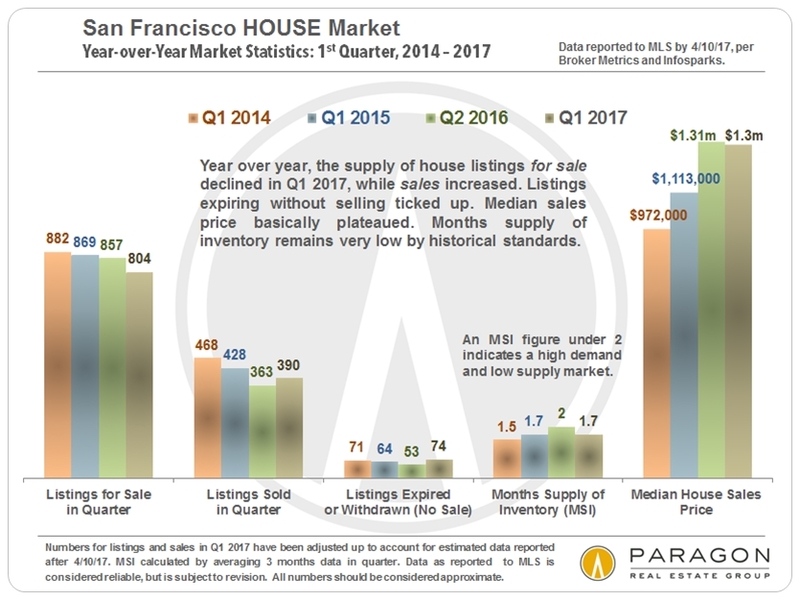 This chart above illustrates San Francisco quarterly median sales price movements since 2012, which, as one can see, is also prone to significant fluctuation. In Q1 2017, the median house price basically plateaued year over year, while the median condo price actually increased from Q1 2016. (Historically, it is not unusual for Q1 median prices to drop from Q4 due to seasonal reasons, mainly the characteristic big slowdown of luxury home sales in mid-winter.) Q1 is the quarter of the year with the least number of closed sales, so too much should not be made of its data, but we have summarized annual Q1 dynamics for the past 4 years in the 2 charts below. For context, remember that 2014 and 2015 were particularly feverish markets. A much better assessment of the direction of the 2017 market will be possible after Q2 data is in: March through June is usually the most active selling season of the year. 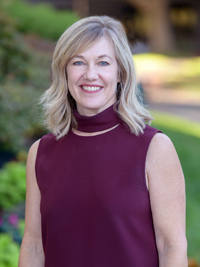 Generally speaking, in higher priced areas, median house prices have been plateauing or dropping a little, while the more affordable neighborhoods have continued to appreciate: This is a relatively common dynamic around the Bay Area. The only way to assess value or appreciation for a particular home is by performing a comparative market analysis tailored to its specific location, condition and circumstances. 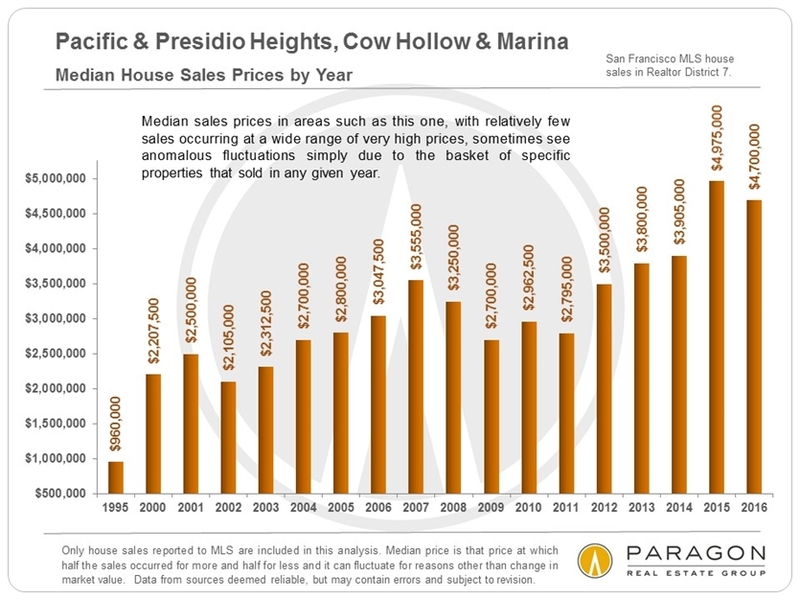 Of all the neighborhoods graphed above, the Marina has by far the fewest house sales and the widest range of individual home sales prices, so it is most susceptible to median price fluctuations caused by other factors besides changes in value – for example, a substantial change in the listings available to purchase in a given year. We do not believe that the same Marina house selling in 2015 would have sold for 15% less in 2016: something less, perhaps; 15% less, very unlikely. 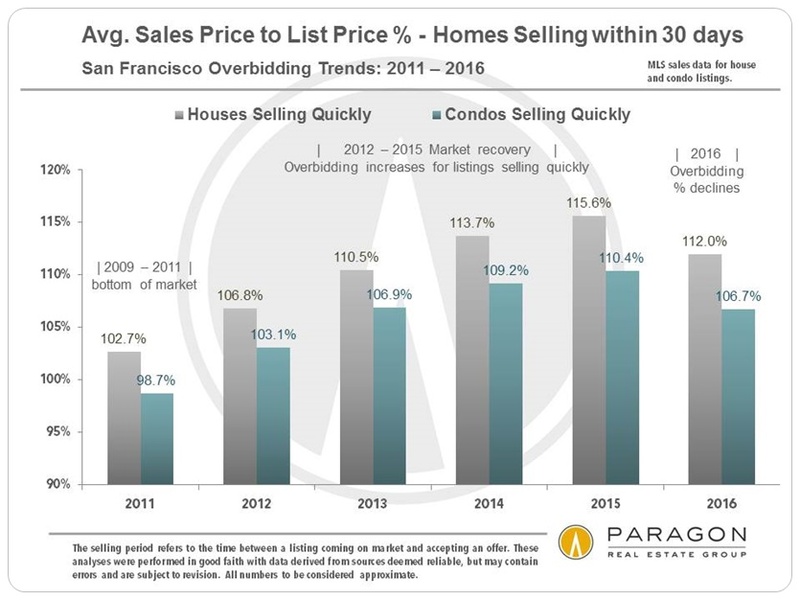 This is a good illustration of the dangers of making too much of median sales price changes. 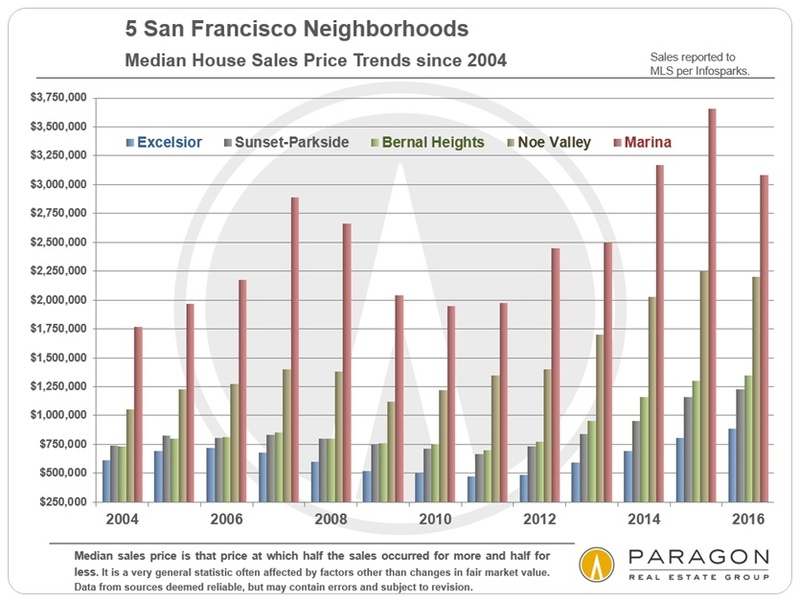 If you would like median home price trends for another San Francisco neighborhood, please let us know. 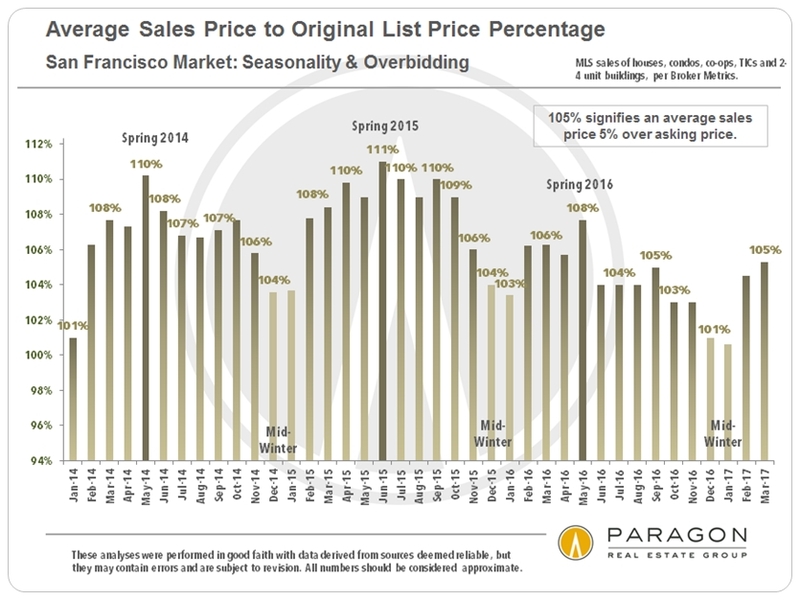 As seen in this chart, overbidding typically heats up as the market moves into spring. So far, this year has been no exception, though the overbidding percentages are somewhat lower than in recent years. For clarity and meaningfulness, we much prefer annual trend analyses, with their much bigger data sets, and have recently completed a comprehensive review of virtually every statistic we could think of on that basis. Doing so allows us to stand back to see the broader view of what is happening in the market, instead of getting obsessed by what happens to be in front of our shoe. Looking at annual trends, virtually all the market statistics illustrate the same general conclusion: The market became progressively stronger coming out of the 2009-2011 housing recession; the frenzy peaked in 2015; and the market cooled a bit in 2016, condos more so than houses. This is a generalization of the macro-trend: Different market segments have been going in somewhat different directions and speeds in the city and around the Bay Area in the past year or so. 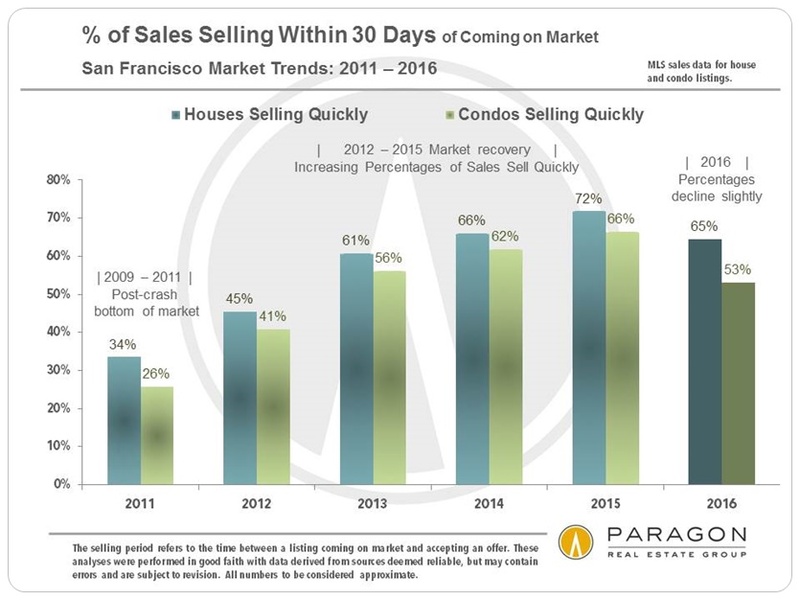 First 2 charts: The hotter the market, the greater the percentage of listings that sell quickly, and the more ferocious the competitive bidding on those listings. 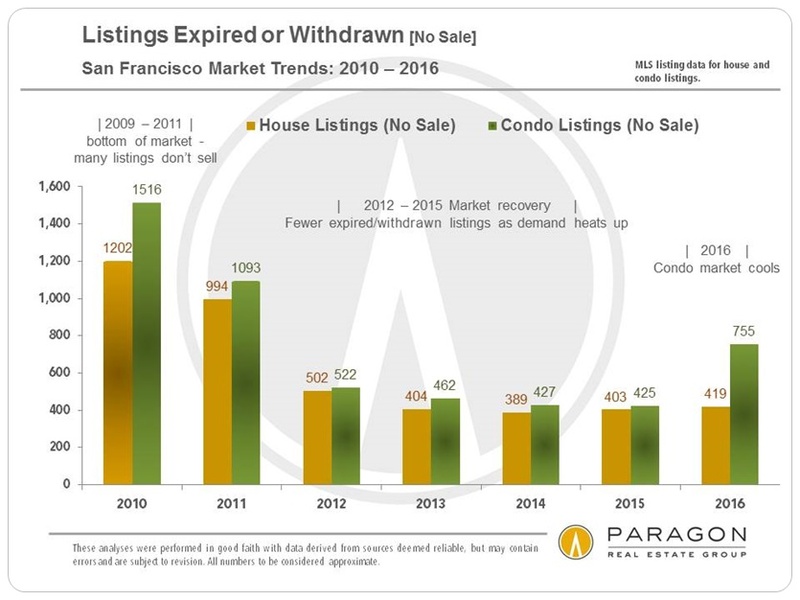 Annual Trends Chart 3: As a market begins to cool, the number of listings that expire or are withdrawn without selling increases. This is typically due to increasing supply, softening demand, sellers looking for more money than buyers are willing to pay, or all three. Annual Trends Charts 4 & 5: As new condos and new rental apartments came on the market in greater numbers in the past year, it cooled those two market segments, much more so than the house segment, of which hardly any are built new in the city anymore. (The more affordable house market in the city has remained remarkably hot.) 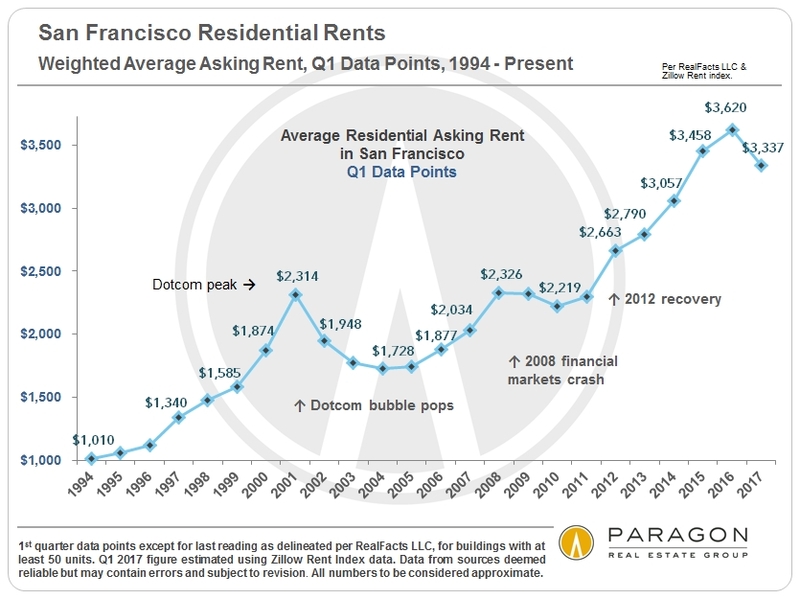 The rental market was affected most as more new rental units came on market than at any time since WWII: Though SF still has the highest rents in the country, they have dropped from their peak in 2015. 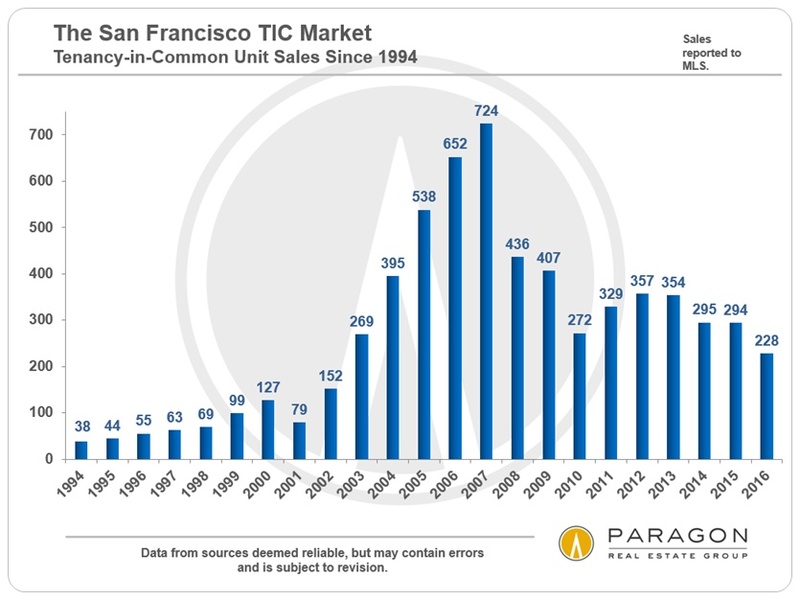 Chart 6: To a large degree due to big changes in tenant eviction and condo conversion laws, the TIC market has gone through a large decline in sales volume. It is also true that after decades of turning multi-unit buildings into condos and TICs, the supply of such properties available to do so has declined. Generally speaking, TIC median sales prices plateaued from 2015 to 2016 at about 14% below the median condo price. Three sample charts from our big report on the high-priced home segment. 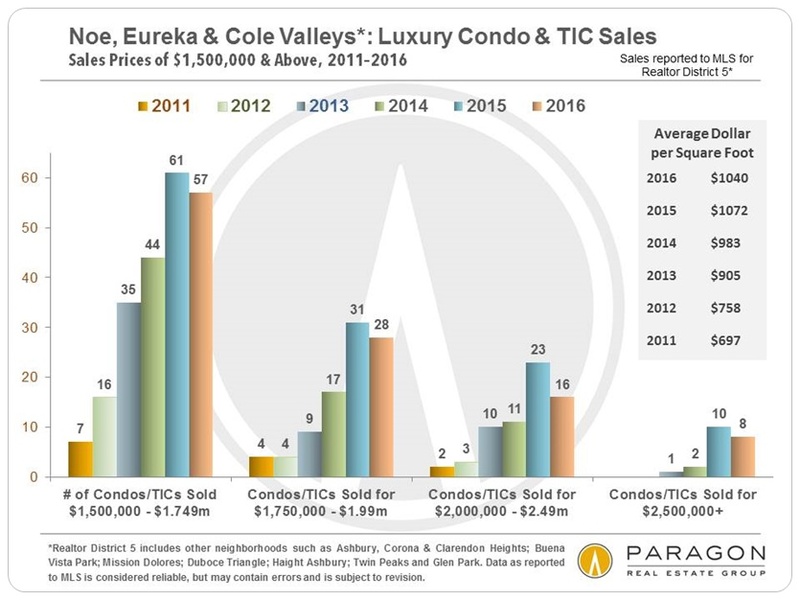 Generally speaking, the luxury market has cooled more than the more affordable segments, and the luxury condo market has cooled more than the luxury house market. This is mostly due to the recent surge of new-construction luxury condos onto the market in the city. The first two charts below are snapshots of either the house or condo segment of the luxury market in two of our major districts. 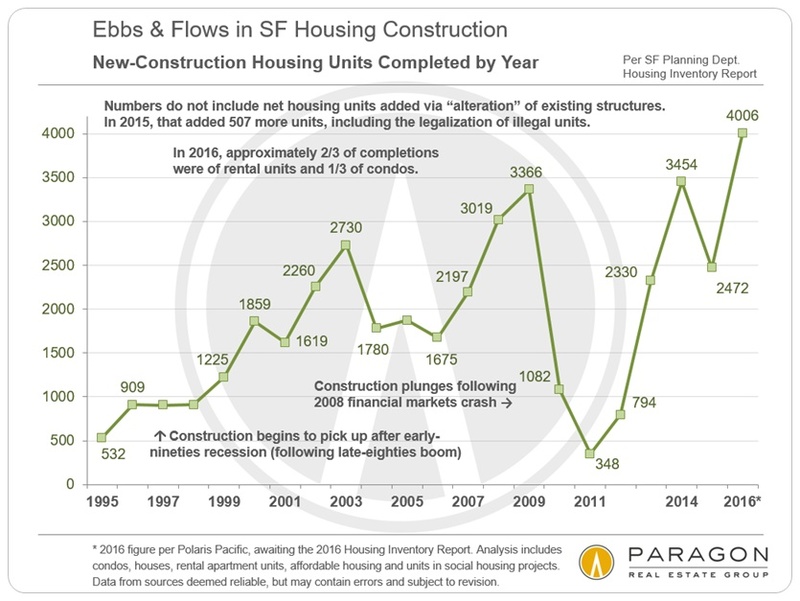 This next chart illustrates one of the bigger changes in SF high-end home markets. 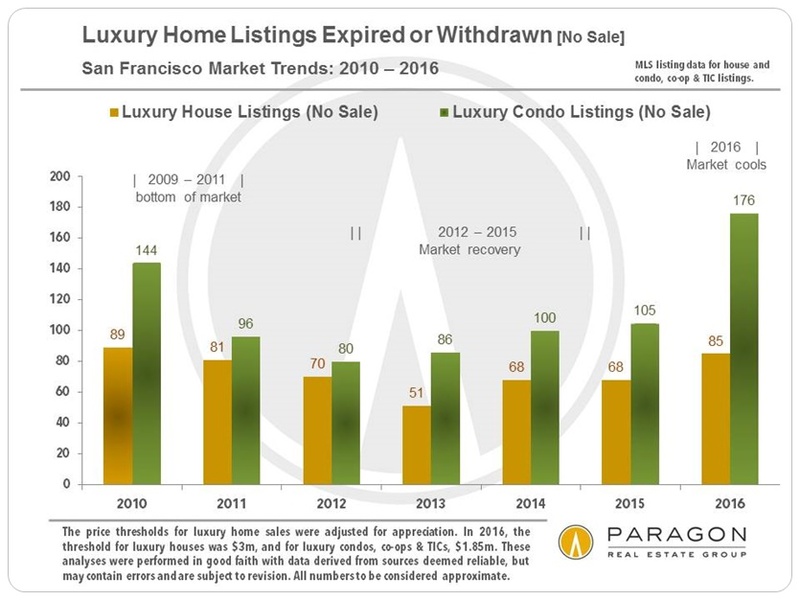 Many more listings, resale luxury condos in particular, are expiring or being withdrawn from the market without selling. 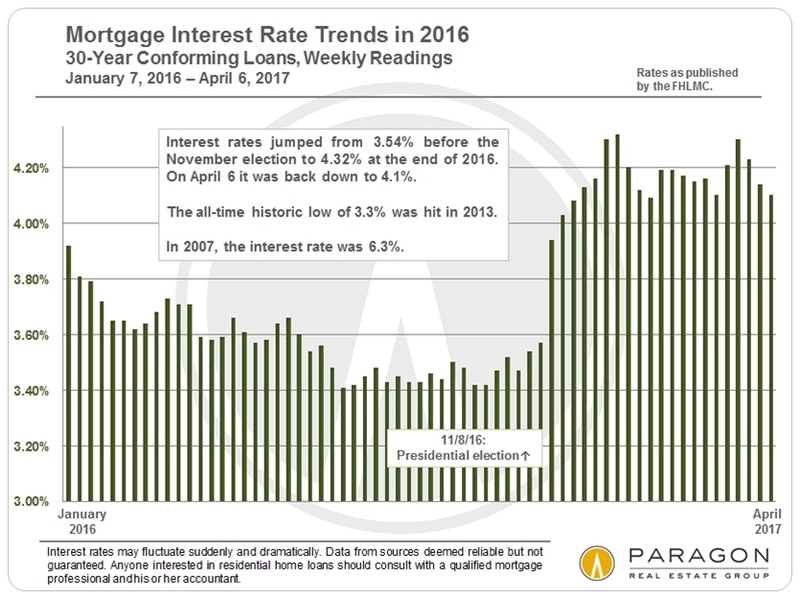 Constantly shifting economic and political factors continue to affect rates: Mortgage interest rates are significantly up since the election, fluctuating up and down since the year began, but still far below historical norms. This is a factor everyone is watching carefully because of its potential impact on affordability, already a big issue in the Bay Area. 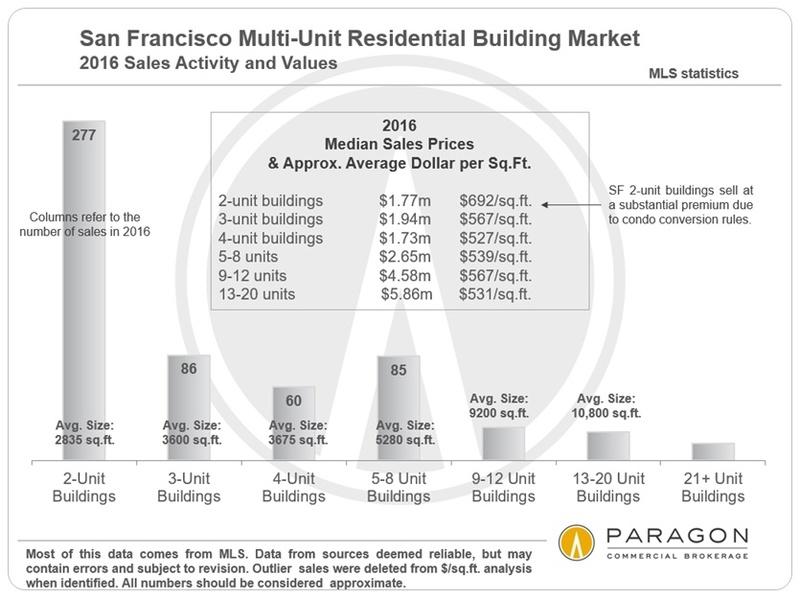 We have also released our quarterly report on the multi-unit residential property markets of San Francisco, Marin and Alameda Counties: Bay Area Apartment Building Market. Below is one of its many analyses. 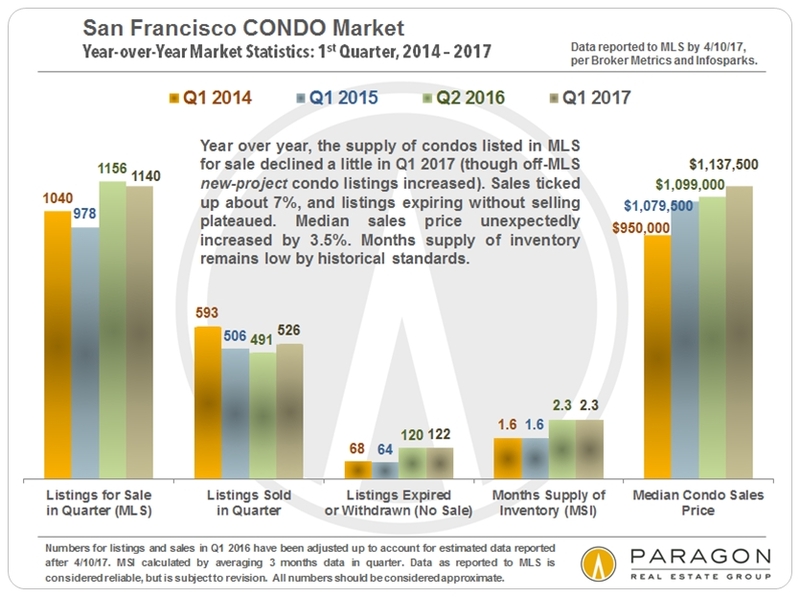 If you will forgive a little celebrating on our part: In the last two quarters, Paragon sold more San Francisco residential and multi-unit residential real estate than any other brokerage (as reported to MLS, per Broker Metrics), even though we have far fewer agents than many of our competitors. If you have any questions or comments regarding this report, or if assistance can be provided in any other way, please call or email.